Unibody Design (Simple 2 in 1 Type) provides a stress free setup. No flight or shaft separation during play. Unique CONDOR Cut shaft design keeps air resistance to a minimum & allows for an incredibly close grouping. Amazing Flexi-Soft Design uses strong flexi-soft type material that allows a tight fit with only minimal force needed to tighten. 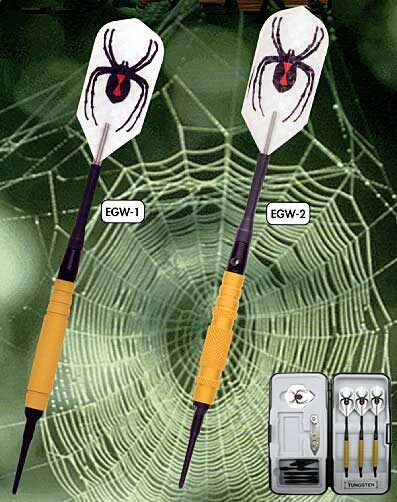 This provides a tight performance, low impact, greatly reduced deflections & easier grouping. Increased Bull Accuracy by up to 4.76% is based on professional players (including No.1 Japanese Darts Player Yuki Yamada) aiming at the bull using folding type flights & standard market shafts over a 100 throw process. Lighter than other flight/shaft combinations the weight distribution of the dart barrel becomes slightly front heavy. Also air buoyancy is slightly increased, so it is advised to use a slightly lighter than usual throw.